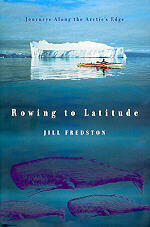 Rowing to Latitude by Jill Fredston (North Point Press, 289pp, $24) is a high adventure narrative based on the author’s many rowing trips on the rivers and seas of the far north. It is also a quiet meditation on the larger questions of life. Sound like an oxymoron? On the contrary. For Fredston, an avalanche expert based in Anchorage who spends summers engaged in wilderness rowing, the relative solitude combined with the physical and mental challenges of functioning in an extreme climate, enable her the time and freedom to consider the big picture. That attitude, shared by her husband, traveling companion and fellow avalanche expert, Doug Fesler, is the direct result of doing what they do. “Wilderness rowing is far more than a sport to me; it has been a conduit to knowing and trusting myself. It is my way of being, of thinking, of seeing." Rowing to Latitude chronicles nine separate wilderness rowing trips completed by Fredston and Fesler between the mid-1980s and the late ’90s. Together they have explored the inland passage of British Columbia and the coasts of Alaska, Norway, Labrador and Greenland and circumnavigated the island of Spitsbergen (north of Norway). One idyllic summer they rowed the 2000 miles of the Yukon River from its source, Tagish Lake, in the middle of Canada’s Northwest Territory, to the Bering Sea. “..the longer we stayed on the river, the more its sounds and smells and horizons became the sum of our consciousness. And maybe as a result, the people of the river began to give us more of their time.” Another summer, they tackled the Mackenzie. “For us, the value of travel is in the knowledge that when we go home, we will not return to exactly the same point.” In actual fact, they often camp on their own deck for several days after returning because their house feels too confining. To Fredston’s great credit, both as a writer and as a clear and practical thinker, the book is not a sloppy paean to nature. Nor is it a polemic; nor a collection of miasmic abstractions. Balance and well-considered choices are the foundations of her unique and independent lifestyle and her writing style as well. The author shares her travels through some of the most exotic and demanding geography on the planet in a genial conversational flow spiced with ample doses of humor (leaving Cambridge she was relieved to be rid of “manicured greens and…overcooked brussel sprouts”) and oddly homey similes, “skinny barrier islands parallel the coast like string beans laid end to end.” The observations and revelations of her quick mind; the challenges and the delights of her arduous physical adventures create a uniquely pleasing rhythm of excitement and rumination. This book is as much to be savored as it is to be learned from.